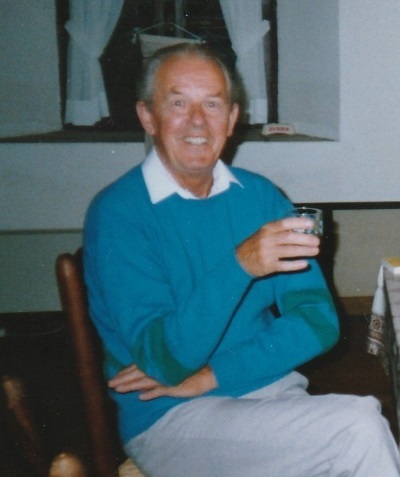 Thomas Cameron Boyle Talbot, ‘Cam’ to family and close friends, a founder member of our Society, died in June 2001, aged 79. He was born in Gorey, Co. Wexford, the son of the Rev. Thomas Talbot and Mrs. Constance Talbot (née Lyster). His father was Archdeacon Talbot, of Ferns, of the Church of Ireland. His mother died when he was young and he was educated at Campbell College, Belfast, and later studied Engineering at Trinity College, Dublin and Queen’s University, Belfast. However, World War II intervened and he left before completing his degree to join the R.A.F., training in electronics. He worked in Radar, serving mainly in the Middle East, especially in Egypt. After the war he did not resume formal education but joined the electronics industry in design and, later, administration. He worked for Bush Radio in Plymouth before setting up his own firm, Orbit Controls, in Cheltenham in 1968, which specialised in control instrumentation. He sold his business, retiring to Eckington in 1985. Literature, in which he always read widely; a keen crossword solver, he then took up Bridge. Although he was a great family man and always enjoyed a party, it is sad that he never saw his first great-granddaughter, born in October. His interest in History came late. It began, as so often, in a study of his family tree which proved difficult as so many of the Irish records were destroyed in the 'Troubles' of the 20’s. An appeal for help from the Worcester Records Office got him more directly involved. Finding he could not read old documents he attended a course at Bromsgrove, and some years later, a course in Medieval Latin. He subsequently transcribed many Eckington wills. In 1990 he saw our notice about starting a Society and was involved from the start. He was a committee man and Research Coordinator. He involved me in sharing in his research, resulting in two volumes of Tewkesbury Wills. He insisted on putting my name first, although he did most of the work recording the wills on disk and binding the books. He acquired a word processor in 1990 and a computer in 1997. As late as 2000, he attended a computer course. Marion and he devised their own Millennium Project, to drive round the complete coastline of Great Britain, doing it in sections. They were within a few days of completion when he was taken suddenly ill at Loch Carron and died soon afterwards in Inverness. On the day of his attack, they had visited the Ian Cameron Museum! His wide and scholarly interest in History can be appreciated from his contributions to this Bulletin. Had the Woodard Award been available in the early years then his elegant style and original research would have surely won the prize. His articles include Wills, The Capell Family in the seventeenth century, Dora Bland mistress of William IV, The Cotswold Tobacco Industry, Early Tewkesbury Freemen and finally Dudley Digges. This article, I have been privileged to complete: truly a labour of love and respect! Dudley Digges was a remarkable man of many interests and accomplishments. So too was Cameron. He will be sadly missed. Copies of the two volumes of Tewkesbury Wills can be consulted at the Town Library and they have also been entered, thanks to Cameron’s computer expertise, to the Woodard Database.